Heading north on Route 93 toward New Hampshire, we were tired, asking ourselves if the long drive would be worth it, but we were determined. 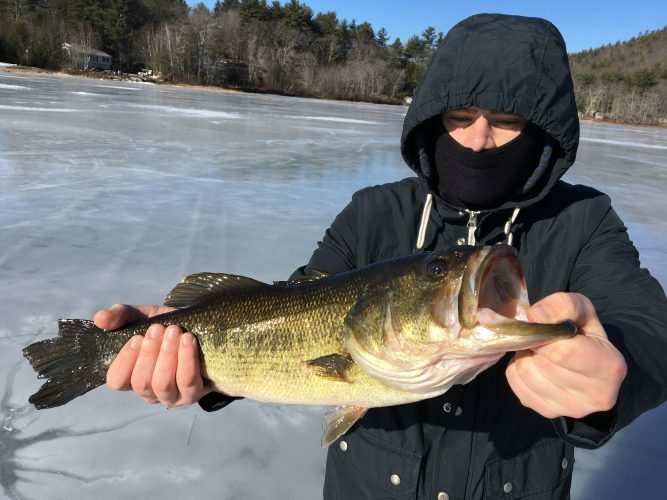 On a warmer than average day on Cape Cod, Massachusetts, my friend Josh and I had decided to take an ice-fishing trip up north to salvage the warm-winter curse blanketed over southern New England. We were headed to a lake I’d never even seen before in a state I’d only fished once, with the goal of helping Josh catch his first fish through the ice. My car was packed to the gills with ice-fishing gear and camera equipment when we left Cape Cod bright and early around 4am. In addition to catching fish, I planned to capture the trip for my YouTube channel “FishAholic Fishing”. For many fishermen, fishing a lake for the first time with very little to no knowledge can be daunting. The only thing I knew was the fish species present, where I could park, and the lake depths—thanks to my handheld Earthmate PN60 GPS paired with Navionics lake maps. I’ve enjoyed the challenge of fishing new lakes since before I could drive, when every day after school my father and I would pick a random lake on the map and fish it until we figured it out. 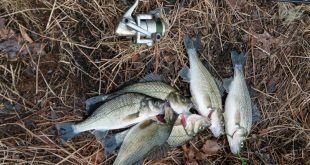 Now, fishing new lakes up and down the East Coast is a passion of mine, and I’ve found that applying what I’ve learned at other lakes helps me be successful on new lakes. 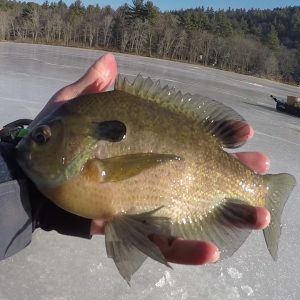 Bluegills as big as your hand are fun for new and old anglers. Once we reached New Hampshire, we snaked through the backcountry mountain roads and found Lake Massasecum, our target for the day. But first, we stopped to get some large and small shiners for bait. When we finally took our first steps onto the lake around 9am, it was only 7°F, but with a rising sun and no wind. It felt like we were stepping into the unknown as we crossed the barren lake. Using my GPS, I first looked for shallow flat areas where the average depth was between 4 and 10 feet with a gradual slope. You can find these areas by looking at contour lines—the closer together they are, the steeper the drop-off, and the further apart they are, the more gradual the slope. With help from the lake maps on my GPS, I can get a general idea where the slope goes from gradual to steep. But in the end, the only sure way to know is to drill holes and check the depth with a fish finder. Outfitted with a Marcum Showdown Ice Troller, I drilled a hole to take the depth and found the shallowest point on the flat. Then, I circled the area, drilling various holes 50 yards apart, trying to track the contours. Lake Massasecum, at just 402 acres, is not a huge lake (but not a small lake either). After finding the exact point where the flat dropped from 10 feet to 16 feet, I dropped a shiner and set my first tip-up right on the edge in 10 feet of water. Then, I had to make the decision to fish deep or shallow. Ninety percent of the time, it’s shallow because that’s where you’ll find aquatic vegetation. I set up the last two tip-ups in 6 and 4 feet. Pickerel can be an easy target on a new lake because they feed throughout the day. Feeling comfortable with my tip-up positioning, we drilled a few more holes for jigging. I set Josh up with a light action 24-inch ice rod, perfect for panfish, to try to help him ice his first fish. 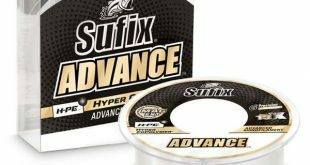 In the first hole in 4.5 feet, he dropped down a small 1/32-ounce diamond ice jig tipped with a soft plastic Berkley Gulp Alive Waxie. I sat down next to him put my Showdown Ice Troller in the hole, and while explaining the process of how to work the bait and use the spring bobber, a school of fish appeared on the screen. It’s always a delight to see that when fishing a new lake! With my coaching, Josh ended up icing his first fish, a chunky 8-inch bluegill, and within 5 minutes, he landed another. I decided it was my turn to get some fish, but before I could, Josh hooked a good fish on his small jigging rod. I ran over and coached him through the process to get the fish to the hole, and he was rewarded with a nice 26-inch pickerel, caught on a jig the size of a pea fished on 4-pound test. I went back to jigging and made one jig before a flag went off. 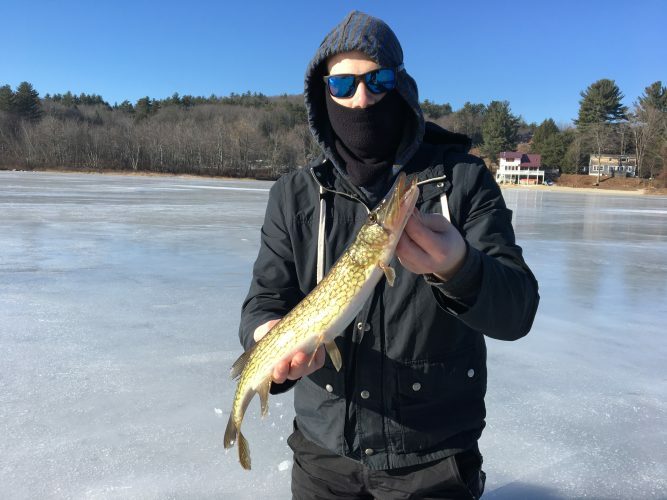 Sprinting over with excitement, we iced the first tip-up fish of the day, a 10-inch pickerel. It was nothing to write home about, but something to learn, as this tip-up was the shallowest one, set up in 4 feet of water. I reset the bait, and five minutes later the same flag goes off again. We sprinted over and immediately I saw the line flying off the reel. I grabbed the line and set the hook, and the weight told me right away it was no panfish or pickerel. Finally, the gaping mouth of a 3½-pound largemouth came to the hole. I got a little overexcited, because it was the first big fish of the day—and after less than 45 minutes of fishing on a new lake. The moment was priceless. After that, I moved the tip-ups, bringing the two deeper ones into 4 and 5 feet of water. As soon as I reset, another flag went off. We sprinted to the flag and noticed the reel wasn’t moving at all. Thinking it’s a small fish that would be good practice fish for Josh, I coached him through the process and he ended up landing his personal best largemouth bass, a 19-inch, 4-pound fatty! 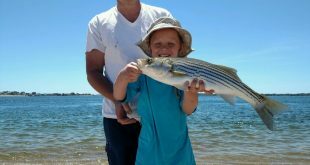 For the next 3 hours, we ran back and forth chasing flags, catching mostly pickerel and the occasion greedy jumbo perch. At midday, the fish got finicky. We would have flags go off, but when I looked down the hole I’d actually see pickerel and perch nosing the bait but not committing. So, if a flag went off with no fish, I would pull the bait and send down a little spoon and end up immediately icing a pickerel. Pickerel are really fun on jigging rods because they love to run and put any 1000 reel and 24-inch ice rod to the test. 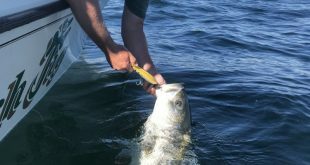 We also explored around a little and found some good jigging areas, hooking into some yellow perch. 4lb Largemouth that ate a small shiner below a tip up. Then, the tip-up bite started again. A flag would go off, we would ice a hefty pickerel, set the shiner, and then another flag would go off. We did this until the sun went down below the trees, ending a perfect day on the ice. A day on the water like this one is something I live for—filming and fishing, and helping friends catch fish. Finding success on a new lake is one of the best feelings in fishing. Whether I travel south or north, I am always excited to learn something new, catch fish in a new place, and catch it all on film for all to see.